Dhaka, 11 Mar, Abnews: The third span of the 6.15 km long Padma Bridge was installed on Sunday morning. With this around 450 meters of the Padma Bridge is now visible. A total of 41 spans will be installed in Padma Bridge, each 150 meters long. The 6.15-km bridge will have a total of 42 concrete pillars. The installation process started at 7:30am. 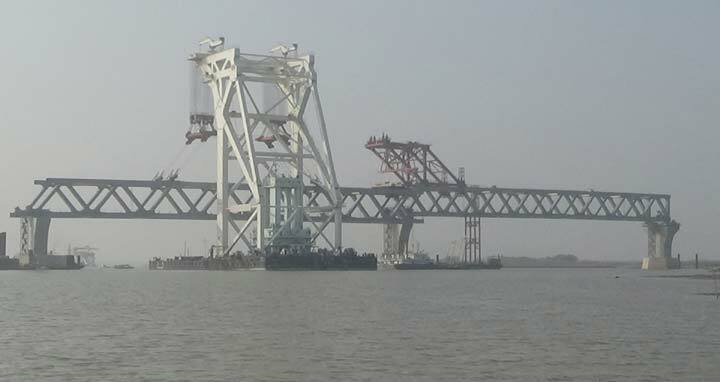 The floating crane carrying the 150-metre span weighing 3,140 tonnes reached near the pillars on Saturday afternoon. Earlier on September 30 last year, the 150 meters first span was installed on the pillars 37 and 38. The construction work on the country’s largest bridge started in December, 2015 and it is expected that the mega construction will be completed by December this year.